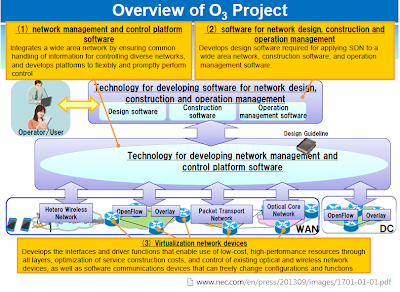 Leading Japanese companies, including Fujitsu, Hitachi, NEC, NTT Communications and NTT, announced the launch of the "Open Innovation over Network Platforms" research and development (R&D) project, also known as the "O3 Project". 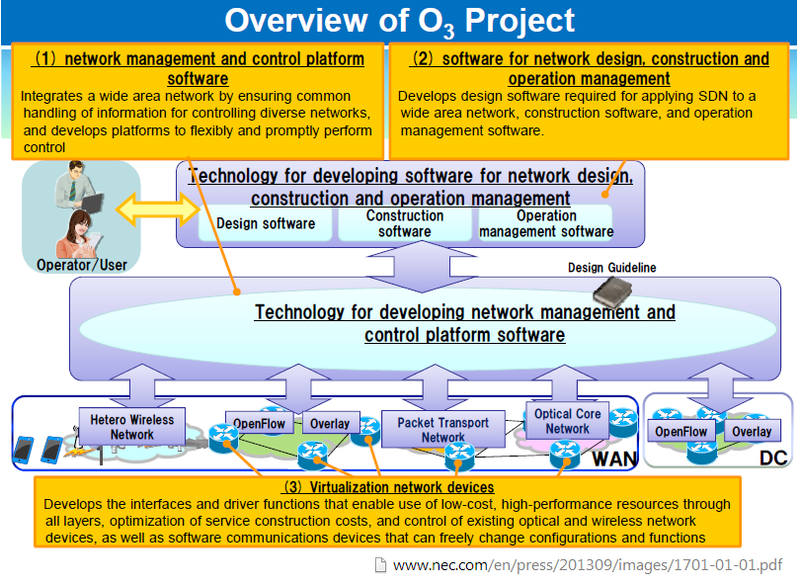 The project, which is supported by Japan's Ministry of Internal Affairs and Communications, aims to develop network virtualization technology that enables multiple telecommunications carriers and service providers who share network resources to design and construct networks and manage their operations freely to suit their needs. 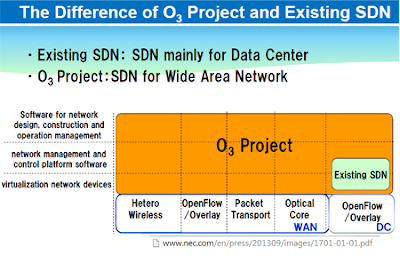 Specifically, a common SDN layer will be developed to integrate a multilayer infrastructure consisting of optical, wireless and packet communications platforms. Compared to existing SDN architectures, the O3 Project targets a common, multi-carrier framework that would enable any Service Providers to share resources. 3) Technology for developing virtualization compatible network devices -- this includes the interfaces and drivers that enable use of low-cost, high-performance resources through all layers. Some of the applications being discussed for the testbed network include Big Data, 8K HD video broadcasting and global enterprise intranets. Over the next three years, the partners plan to develop prototypes and to conduct verification testing of the network virtualization technology. NTT Com's Nationwide SDN for Uncompressed HDTV received the Innovation Award in Content Delivvery at IBC 2013. The service provides stable transmission of uncompressed high-definition video images between the 128 members of the Japan Commercial Broadcasters Association via a large-capacity and highly reliable network. NTT Com said the value of SDN in this application is that it enables simplified functionality for broadcasters, such as adjusting the bandwidth requirements of each station according to their program schedule. By centrally managing the network, the technology flexibly and efficiently manages traffic to ensure the flawless and timely transmission of vast amounts of data between stations. 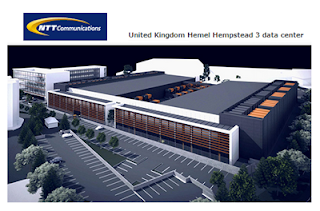 NTT Communications has begun construction of its Hemel Hempstead 3 Data Center, located northwest of London. This will be the third data center for NTT at the site. The new, modular, Tier IV facility will be about 10,000 m2. It will leverage the latest energy saving technologies and is expected to deliver a PUE of 1.2. NTT Com estimates the data center market is growing 20% year-on-year in the UK. Agilent Technologies plans to separate into two publicly traded companies: one in life sciences, diagnostics and applied markets (LDA) that will retain the Agilent name, and the other that will be comprised of Agilent's current portfolio of electronic measurement (EM) products. The new EM company, which will be named later, holds a leading position in major markets including communications; aerospace and defense; and industrial, computers and semiconductors. FY13 estimated revenues are $2.9 billion. 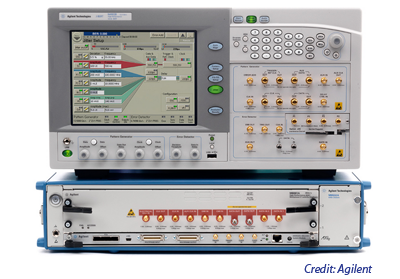 Key products for the EM company include: signal sources and signal analyzers, network analyzers, one-box testers, oscilloscopes and testing instruments, software and services. The EM company will be headquartered in Santa Rosa, California and initially is not expected to pay a dividend. It has about 9,500 employees. Boingo Wireless agreed to acquire Advanced Wireless Group (AWG), the second largest airport Wi-Fi provider in the United States. Financial terms were not disclosed. AWG operates public Wi-Fi in 17 U.S. airports, including: Baltimore (BWI), Boston (BOS), Buffalo (BUF), Burbank (BUR), Charlotte (CLT), Detroit (DTW), Indianapolis (IND), John Wayne (SNA), Los Angeles (LAX), Miami (MIA), Minneapolis – St. Paul (MSP), Oakland (OAK), Omaha (OMA), Providence (PVD), Sacramento (SMF), and San Diego (SAN). The company has also been chosen to operate the public Wi-Fi services in Phoenix’s Sky Harbor (PHX) airport. After the acquisition, Boingo will operate the public Wi-Fi services in nearly 60% of North America’s top 50 airports and more than 40% of the world’s top 50 airports, representing more than 1.4 billion passengers per year across all airports. 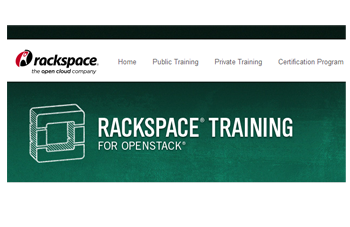 In an effort to build on the momentum of Openstack, Rackspace is launching an on demand e-learning training course, adding four new classroom-based courses and establishing a training partner program. Rackspace noted that at its 3-year anniversary mark in July 2013, OpenStack had more than 10,000 contributors; greater than 1,000 code authors; more than one million lines of code and was utilized by more than 200 companies in 120 countries. The BSA Global Cloud Scorecard 2013 predicts an estimated 14 million cloud jobs will be created by 2015. Violin Memory released a Memory Services software suite for acceleration, tiering, migration and protection of application data in the enterprise data center. 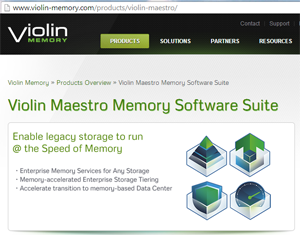 The Violin Maestro suite of Memory Services, which runs on memory-optimized, hardware-accelerated Violin Memory Appliances, provides non-disruptive migration of data off legacy storage to high performance Violin Memory Arrays. The company said its software transparently learns application I/O patterns and accelerates performance. The software provides dynamic tiering of application data between Memory Tier and disk storage. Zayo Group has begun offering a 100G wavelength services between London and Amsterdam. This is the first 100G route on its European network. Zayo's 100G wavelength platform is already operational in several U.S. locations and will continue to be deployed in Europe during the rest of 2013 and into the first half of 2014. In 2012, Zayo acquired AboveNet for approximately US$2.2 billion. 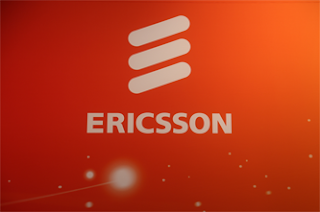 Orange Business Services has chosen Ericsson’s Device Connection Platform delivered as a service to enrich its existing M2M products and solutions portfolio to support international customers. Financial terms were not disclosed. Ericsson said its solution enables Orange's customers to deploy, scale and operate millions of M2M connections using a service portal, available at anytime from anywhere, customers can access self-service functionality to manage and control their installed SIM base, including real-time access to monitor operational levels, support management, and access statistics.